Through the PRIME II Project, Senegalese health center nurse Madame Bâ Fatou Diouf has been trained in postabortion care, including manual vacuum aspiration (MVA), counseling and postabortion family planning service delivery. Having an additional trained postabortion care provider enables the Sokone district health center to offer 24-hour access to MVA services that can save women’s lives, along with contraceptive services to help women prevent future unintended pregnancies. The health center accepts referrals from health huts and health posts that are the focus of an initiative by PRIME to expand family planning services and selected postabortion care activities to rural facilities where MVA for treatment of postabortion complications cannot be offered. With the Senegalese Ministry of Health, PRIME II is developing and testing a model for community-level postabortion care in Sokone that relies on high-quality family planning services to help women prevent unwanted pregnancies. This care meshes with fully functional referral and counter-referral systems among health huts, health posts and the health center for women needing treatment for complications from unsafe or incomplete abortion. Making certain that treatment services are available before creating additional demand is an essential part of PRIME’s philosophy. To ensure that a provider trained in PAC, including MVA, would always be on call at the referral health center, PRIME sponsored Mme Diouf’s participation in a six-day training course in Dakar organized by PRIME partner EngenderHealth in March 2003. The Sokone Health Center serves 14 health posts, typically staffed by a head nurse and one or two matrons. Each health post supervises several community-based health huts. PRIME is training matrons and community members who work at the health huts in activating transportation and referral networks, informing women about where to obtain family planning, and identifying the danger signs of obstetric emergencies. Since the matrons at the health huts are often illiterate, pictographic referral forms were developed and pre-tested for comprehension and acceptability. Health post nurses, in turn, are trained in family planning counseling and services and in stabilizing women with postabortion complications for transport to the health center. PRIME II’s model for establishing and sustaining family planning and postabortion care services in the health posts and huts relies on community-provider partnerships supported by the Center for Rural Polyvalent Expansion (CERP), a program of the Senegalese Ministry of the Interior. Drawing on its relationships with mayors, village chiefs, religious leaders, women’s associations and other community-based groups, CERP plays a key role in rallying local authorities to maintain transportation plans and funds for obstetric emergencies and helping health post nurses convey effective, community-supported messages about family planning. Because the program fosters community responsiveness to obstetric emergencies in many of Sokone’s 194 villages, Bâ Fatou Diouf will have more opportunities for using her training to stabilize women with life-threatening complications. Her knowledge and skills in family planning counseling offer her the chance to save women’s lives in less dramatic fashion by reducing the number of unwanted pregnancies that often result in unsafe abortions. Preliminary results from the Sokone Health Center are encouraging: the percentage of women treated for postabortion complications who accepted a modern family planning method after counseling rose to 69% in May from just 17% in January. 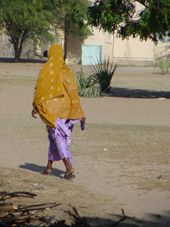 PRIME Voices #21, Senegal: Building a Model for Community-Level Postabortion Care, 7/28/03.